BUK serial numbers explained | What happened to flight MH17? The JIT requested the public at the May 2018 pressconference to provide information on numbers printed on BUK missile parts. This blogpost is an attempt to provide this information. I will update the post as needed. Input is appreciated. There are at least 4 types of serialnumbers. The first is used on the missile tail and container. The other used on the casing and venturi. There are different conventions used for the serialnumber of a 9M38M1 missile. CCC = a batch number. There seems to be a relation between year of production and batchnumber. In 1987 the batchnumber 132 was made. Each batch seems to have between 20 and 40 missiles. DDD = a for the particular batchnumber unique number. Numbers seems to be at random assigned. So the manufacture does not start at 001, next missile is 002 and so on. Batch 220 and 221 seems to be in use by the Ukraine army. 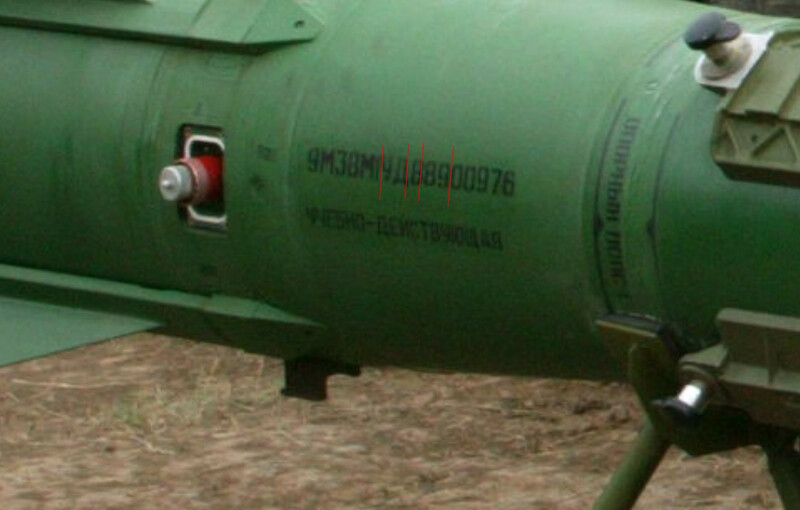 Missile 9M38M1887221023 was provided by Ukraine to the JIT. Missiles of batch made in 86 with number 132 were sold to Georgia. УД= means “УЧЕБНО-ДЕЙСТВУЮЩАЯ or training-working. This is a missile installed with a dummy (fake, not operational) engine and missile warhead. Type 2 convention is applied on the engine casing and on the venturi. Pictures showing the numbers are extremely rare. The photo below was released by JIT at the May 2018 pressconference. 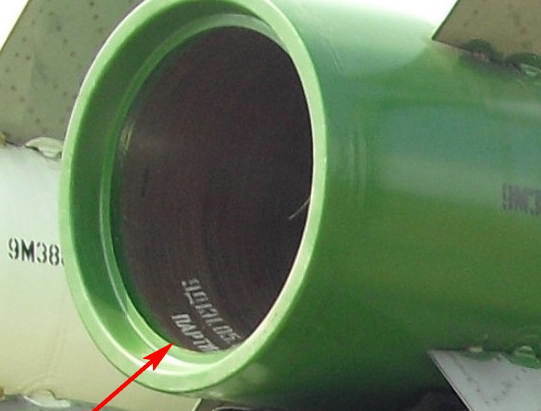 This number is not visible under normal condition as it is hidden under one of the stabilizer vins of the missile. XXXXX= the missile engine of the 9M38 type and/or 9M38M1 type. This is 9д131. 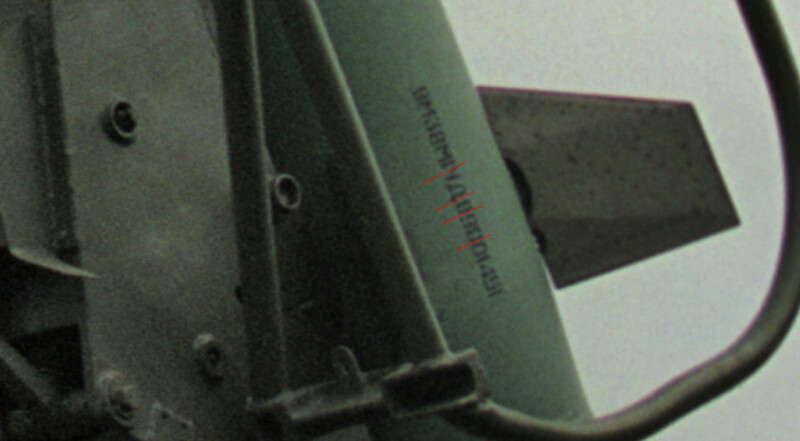 This document suggests the type 9д131 of engine belongs to 9M38M1 missile. Another document suggests this is a 9M38 missile. CCCC=unique identification number of this specific missile engine. xxxx = always 9д131 which is the type of engine. aaaaaa = unknown. Seems always to start with number 05. It could be a reference to a version of documentation on the engine. so 830113 is missile 113 made in August 30. The year the engine was produced in is likely determined by the serialnumber printed on the outside of the missile. There is just one photo available showing this number and that is the one released by JIT. The number shows 616039. It could be that 616 is the batch and 039 a sequence number. It could be this number is the same as the one printed on the missile nose and tail section. 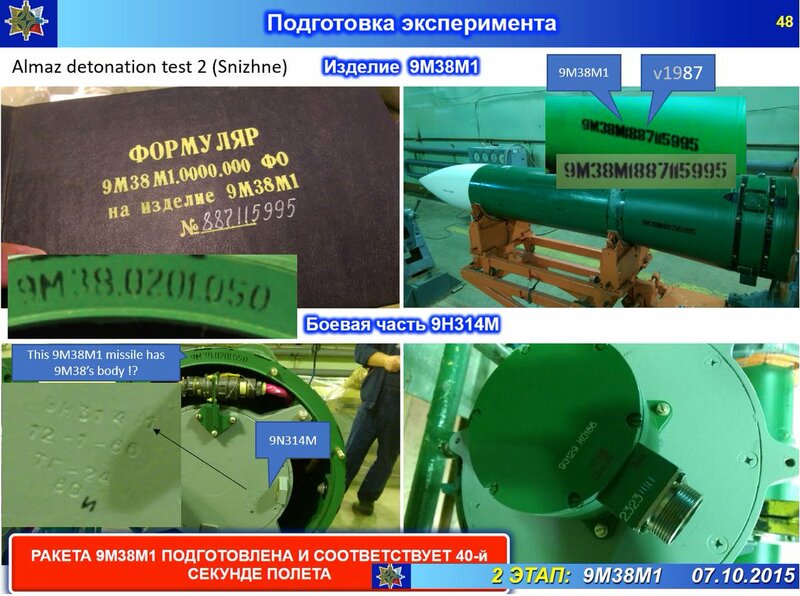 The numbering scheme for the 9M31 missile in use by Russia is slightly different. For the newest 9M317 missile a different numbering convention is used. xxxxx = the type of missile 9M317. 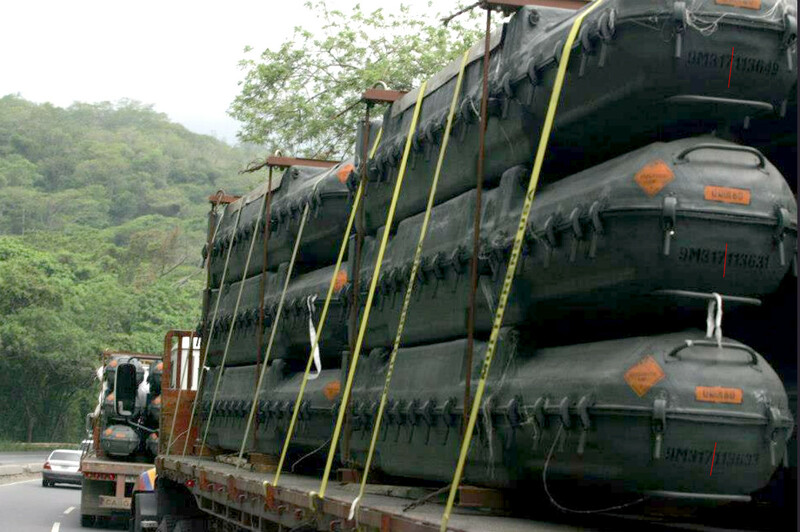 The photo below shows 9M317 container of the Venezuela army. op hun tafeltje ligt. Denken ze nou echt dat iedereen DEBIEL is? in vrije val iedere seconde toeneemt met ongeveer 9.81 m/s2. —- a = gravitatieconstante t = tijd s = snelheid. van 447.2 meter per seconde op de oppervlakte terecht zijn gekomen. Maar jij ben in elk geval wel DEBIEL. Je moet uitgaan van een val met luchtweerstand en niet van een val in vacuum. Als je het sommetje dan nog een keer doet kom je op veel lagere valsnelheden uit.